Bodie and Doyle - BODIE 3.7 . you'll never walk alone ! you are very welcome and thankyou so much for looking ...glad you like it . 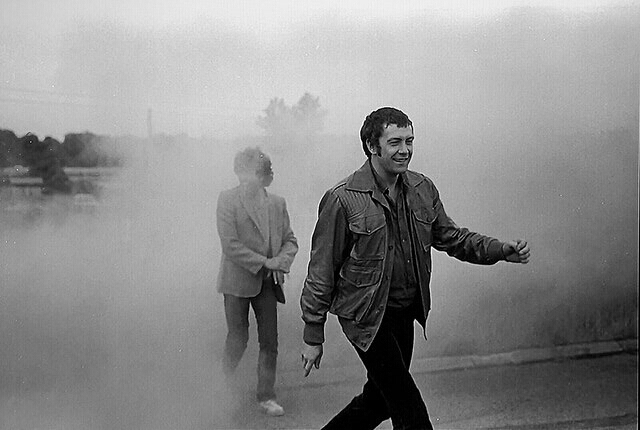 So, Doyle is looking to see if a car is coming, but Bodie... *g* Lovely shot in the smoke! Atmospheric and gorgeous. Thank you! thankyou so much for looking and i'm glad you like it ...the smoky atmosphere really makes this picture i think . Is this an out-take, or a rehearsal, do you know? Where is it from? And thank you for sharing it, it's a great pic! thankyou so much for looking ...this is from the gallery section so it was probably a rehearsal shot ..glad you like it. it's perfect for these two . that is definatley one way of describing these two ..love it and thankyou for looking and commenting . That's a great pic. Don't know what they've been doing, but why is MS clutching his wrist and LC striding ahead looking all alpha male? Have they been playing again? it looks like these two have been playing it rough again *g*...thankyou for looking and glad you like it . And another fabulous piccie - I've no idea what they're up to, but they're having way too much fun for anyone's good. yes they certainly seem to be enjoying whatever it is they have been doing even with the smoke around them ...thankyou for looking and commenting . yes it gives it a special kind of atmosphere though what these two have been doing is anyone's guess ...glad you like it and thankyou for looking .